Every phase of early childhood literacy enrichment leads to one thing: reading. The beginning stages of a child’s reading journey are exciting and magical. Every day seems to bring a new development, every week another jump in progress. The early road to reading uncovers the discovery of new skills and engenders an overall excitement. With that foundation set, the first big step towards educational independence is born – and there’s a lot that goes along with that. This process requires both practice and patience for students and parents alike. Different schools and teachers have set approaches to introducing reading levels and incorporating it into their curriculum. For parents, this can often cause some confusion. There are a few ways to assess a child’s reading level: Guided Reading Level (GRL), Developmental Reading Assessment (DRA), and Lexile Level/Measures are the most common. These systems were designed with one goal in mind: to ensure your child is reading books that are appropriate for their abilities but still inciting consistent progress. But what do these systems mean, and how are they graded? We’ve developed a quick guide to understanding your child’s reading level. The Guided Reading Level system, or GRL, is the practice that we use at Book Nook Enrichment. This program allows students to work with a teacher individually at the beginning of a session to see where they belong on a scale of books from A to Z. Our teachers then ask follow-up questions about the text and story details. We finish up with a short writing prompt to gauge a student’s overall comprehension. All GRL books are leveled from AA to Z, with AA being the easiest and a great starting place for introductory reading lessons. This system works well with readers of all ages and abilities. It gives teachers a chance to understand each student’s strengths and weaknesses in reading on a very individual basis. At Book Nook, we incorporate a benchmark book every 4 to 6 weeks to ensure our students are progressing at their own pace while still being challenged as readers and writers. (GRL is the same system as Fountas and Pinnell, which is the name typically used in elementary schools). The Developmental Reading Assessment, or DRA, is similar to the GRL system in that it requires students to read a book out loud to their teacher, with a teacher follow-up to grade comprehension, phonemic awareness, and more. Teachers also grade on the fluency (the flow of how a student reads with minimal stop and start) for each book. These skills are split into individual groups so students are graded on their strengths in each area as it relates to the whole. 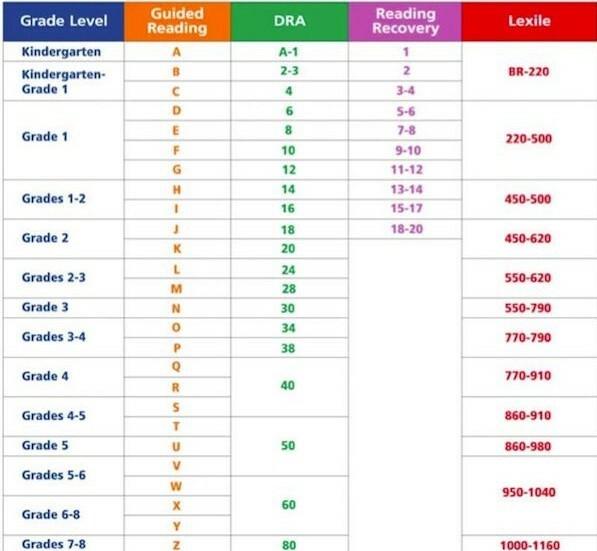 The grading system for the DRA begins much as the GRL, with the easiest books being placed at level A. However, from there it switches to a numeric grading system. Levels range from 1 to 80, with the smallest numbers (1 to 3) representing a kindergarten level of reading and the highest number (80) leveling out at 8th grade. This level system is the easiest to find at your local bookstore. Our favorite brand is Step Into Reading. Each book is numbered, so you can keep track of your child’s level and progress as they move up! A Lexile Measure is the most involved system, and one that is decided through testing at your child’s school. Tests are administered one of two ways: through a Scholastic Reading Inventory test or through a standardized reading test. Your child’s Lexile Level is easy to spot, because it is a number always followed by the letter L. Lexile Levels start small for beginning readers, and max out at 2000L for the most advanced readers. Lexile levels are designated based on the difficulty of a text as a whole and the overall readability for each student. They are not as commonly assigned as the GRL or DRA – but it’s still worth understanding the basics! At the end of the day, the most important thing isn’t your child’s reading level – it’s how reading, and learning, makes them feel. We aim to provide enjoyable reading experiences for children of all ages and all levels. There’s nothing better than finding stories and genres you love – and discovering that reading opens doors to brand new worlds.